The NHL routinely saw teams win championships in clusters until the 1990s, but dynasties have all but disappeared during the past two decades. Nine teams have won the Stanley Cup in the past 11 seasons, and no franchise has successfully defended the Cup since the Detroit Red Wings won back-to-back championships in 1997 and 1998. According to EA Sports, that trend will come to an end this season. 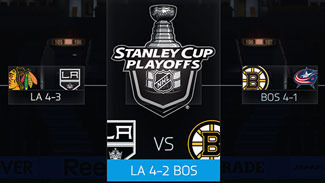 In its annual NHL season simulation released Wednesday, EA Sports predicts the defending-champion Los Angeles Kings will defeat the Boston Bruins in six games in the 2015 Stanley Cup Final for their second straight championship and third in the past four seasons, giving the NHL its first bona fide dynasty in more than a decade. The Conn Smythe Trophy will go to Kings forward Anze Kopitar, who is also predicted to win the Selke Trophy for his regular-season play in the simulation. EA Sports conducts its simulation using artificial intelligence and real-life player data. In an attempt to provide realism to the game, injuries and hot streaks are also thrown into the mix. EA Sports NHL 15 is also the first edition of the popular series to use 12 Player NHL Collision Physics and Real Puck Physics to more authentically replicate the unpredictability of what happens on the ice. To reach the Stanley Cup Final, the Kings again will have to go through the Chicago Blackhawks, whom the simulation expects to face Los Angeles in the Western Conference Final for the third consecutive spring. The Bruins are predicted to beat the Columbus Blue Jackets, who despite losing in the Eastern Conference Final would still have their most successful season to date. The defending Eastern Conference champion New York Rangers are predicted to lose to the Philadelphia Flyers in seven games in the first round. Though the Pittsburgh Penguins are also expected to be eliminated in the first round of the Stanley Cup Playoffs by Columbus, it will once again be a banner year for Penguins center Sidney Crosby. The simulation predicts Crosby to win the Hart Trophy, the Art Ross Trophy, the Maurice "Rocket" Richard Trophy and the Ted Lindsay Award, which would be the first time he has taken home all four awards in the same season. Montreal Canadiens goalie Carey Price wins the Vezina Trophy as the League's top goaltender. The Norris Trophy for the NHL's best defenseman is won by the Arizona Coyotes' Oliver Ekman-Larsson, while Blackhawks forward Patrick Kane takes home the Lady Byng Memorial Trophy. Tampa Bay Lightning forward Jonathan Drouin wins the Calder Trophy as top rookie. The Calgary Flames are predicted to finish last in the 2014-15 regular-season standings.